The traditional data system records what the car is doing and can display lap times, segment times, speed, rpm, water temperature, oil pressure and other car variables. You can use the data system to show how your current predictive lap time compares to your fastest lap, useful for providing +/- times to see if you are faster or slower in various places on the track. After the on track session you can then download the data and compare against yourself or fellow racers that share their data with you. This can help you determine areas for improvement on the various data channels such as the amount of throttle or brake pressure. The downside to this post session review is that it is often hard to determine in the moment on track how to improve and there is definitely a learning curve to understanding and interpreting the data. The ApexPro was designed to give the driver instantaneous, easy to understand, real-time feedback. How Does the ApexPro Work? The unit uses a 9-axis inertial measurement unit (IMU) including accelerometers, gyroscopes and magnetometer sensors combined with a 10-Hertz GPS to determine your position, speed and acceleration among other things. The unit uses machine learning as you drive, taking into account car performance and track conditions to determine the current and maximum possible performance on track. It also re-learns each time you take the track even if the track conditions have changed from the last session, for example foggy damp morning to dry sunshine or even rain. It filters the thousands of measurements it takes to extrapolate out the various corners. So if you are right on the limit in the fast left hander it can convert that and the other data to the slow right hand hairpin even with different track camber or elevation. Thus determining your instaneous maximum grip at any point on the track. To provide instant feedback the ApexPro uses a a set of 12 user configurable lights. The default lights are Green and Red but can be changed to Blue and Red (beneficial for people that are Red/Green colorblind). The lights represent the grip level of the car. The more lights the more grip available. Red (default) the maximum possible grip. Green (default) the current grip level you are using. If you are familiar with the traction circle you can think of the Red lights as the maximum vector on the traction circle at that moment of time. The Green light shows the current traction amount you are using. The more Red lights you see the further you are away from the maximum level of grip. If you see all Green lights then you are at or very close to the maximum limit of the car at that point of the corner. You want to place the unit in your field of vision on the track so you can clearly see the lights. Your eyes are very sensitive to bright lights and motion in your peripheral vision. This can be achieved by mounting the magnetic base plate to the car dash or using a suction mount on the windshield. For our open cockpit Spec Racer Ford Gen3 we used a roll bar mount to connect the mounting plate and then added a zip tie for good measure to make sure it stays in place, incase of an on track incident. The magnetic base with locating pins. ApexPro mounted in cockpit using a zip tie for safe measure. How Does it Make me Faster? With the unit in your field of vision you can see the changing lights and their motion as you drive around the track. If you are not full Green all the way around the track then you are not at the maximum limit of the car and tires. For instance if under braking you see mostly Green lights but there are a few Red lights that means there is more traction and you can brake harder. One Red light under braking going into Turn 5 indicates I can brake just a bit harder. If during the middle of a corner near the apex you see a few Red lights you have more cornering grip available. Most likely meaning you can carry more mid-corner speed or get to the throttle earlier. ApexPro shows Red lights mid-corner indicating I can carry more entry speed. As you start to use the device you will realize there are some corners on the track you are at or near the limit and there are other corners you are not using all the cars capability. This will help you identify which corners to work on. For momentum cars such as the Spec Miata or Spec Racer Ford you will likely see Green lights with a few Red lights going down the straights. You might be planted foot to the floor with full throttle but you will still see some Red lights. This is because the cars do not have enough acceleration to reach the maximum forward traction capability of the car/tires. Higher horsepower cars that can easily spin the tires might see more Green lights on the straights. Down the front straight you can see Red lights in momentum cars. The device can be paired (via Bluetooth) with either your iOS or Android device. This allows you to record the data from the ApexPro and review after the on track session. You can replay the laps back on your phone with the changing lights overlaid on the track map. You can also look at various other bits of data such as lap times, accelerations, speed traces and many more common to other data systems. An internal lithium-ion battery powers the ApexPro. It should last the length of a normal track day (2-3 hours of track time), as long as you turn it off between sessions. When it is first powered up, the ApexPro will flash Green lights for fully charged, Yellow when the charge is getting low but you should have enough charge for another session, and Red when the battery is about to die. Connecting to your device also allows you to calibrate the ApexPro for the specific mounting position in the car taking into account any angle it might have to the road. Simply place your car on level ground, insert the ApexPro in the mounting plate, turn it on, connect to your device and select calibrate. You can also use the wireless capability of you iOS or Android device to transmit your data using “Crew View”. It allows your friends, crew or racing buddies to follow along in real time while you are out on track. With the limitations of the Spec Racer Ford being a momentum car it is hard to gauge based on the lights how I am doing down the straights and places like fast left/right switchback corners or chicanes as I am not able to max out the forward acceleration so will always see a few Red lights. 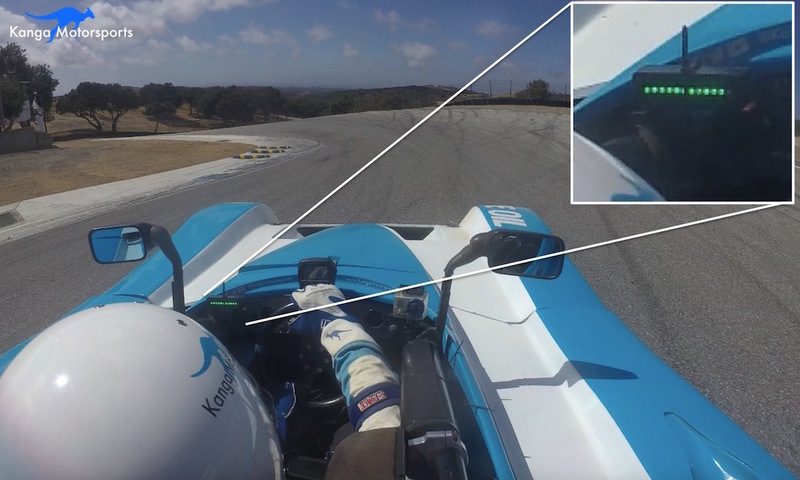 Where the ApexPro really comes into it’s own is being an amazing tool for the driver to improve their corner entry. Keeping the car on the very limit during braking and corner entry is what separates the fastest drivers from the rest. The ApexPro provides real-time feedback letting you know if you can brake harder, carry more entry speed or are really using the maximum turning capability of the tires, especially in the difficult elevated or off camber turns. Seeing those Red lights during corner entry tells you straight away where to focus your testing. Braking into Turn 2 the ApexPro shows Red lights indicating I can brake even harder. With so much going on in the cockpit it is not always easy to spend mental energy on just watching the lights, especially as you are braking, downshifting, looking through the turn and trying to get back to full throttle, all while being aware of the competitors around you. 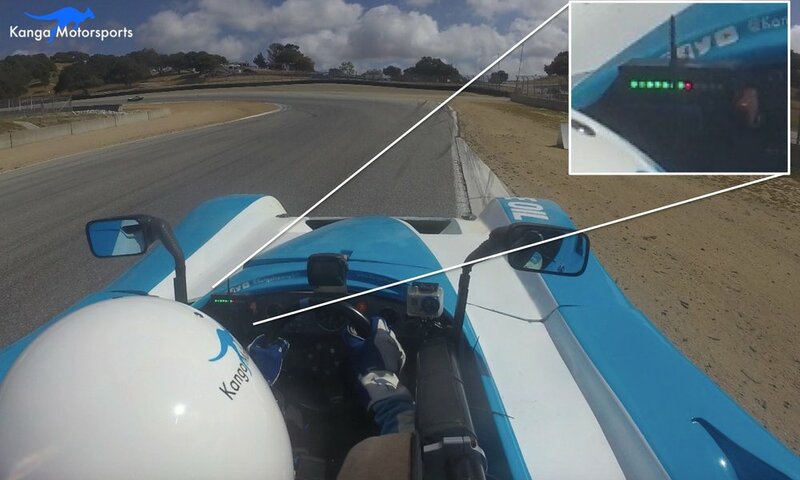 The ApexPro is a great in car tool for providing instant feedback, especially useful in tricky corners like Turn 2 and 9 at WeatherTech Raceway Laguna Seca. I find the ApexPro extremely useful in watching video playback of my in car video. I seem to do Mid-corner and exit really well in most places. It is corner entry where I struggle to find the remaining lap time. Watching the ApexPro with my video and listening to the engine sound, I can quickly tell when I am not at the limit of braking, downshifting poorly, need to slow my hands down or could carry just a little more speed heading into the Apex. All Green lights at the top of the Corkscrew, WeatherTech Raceway Laguna Seca. Big thank you to ApexPro who sent us a unit to try out on the track. The setup is easy and I quickly got the hang of the unit. It is really different than other data systems I have used, it provides instant easily recognizable feedback. The bright visual lights quickly tell you where you are loosing time unlike other systems. On traditional systems you have to poke at the data traces after the fact to see where you can be smoother, faster and save time. I found using both our normal AIM data system in combination with the ApexPro was very useful. The ApexPro lights keyed me into places on the track where I could improve and when I had more time then I could sit down and study the more in-depth AIM data. The ApexPro is a great tool for the amateur racer or track day enthusiast. If you are looking for ways to start with data simply or just want some feedback but can’t afford the cost of a coach, this is a fantastic tool. There are real benefits for people new to data, you don’t need to fuss with complicated user interfaces and learn how to read and interpret the squiggly data traces, instead you can just drive and try to get rid of all those Red lights. Combine it with an in car video and you can really learn a lot about your driving and areas to improve. If you want to know if you are threshold braking and carrying the most entry speed possible this is the perfect tool. I would recommend trying it. Have fun and #TrustTheLights. Want other great Racer Tips and Motorsports Articles sign up for the monthly Kanga Motorsports Newsletter. Sign up to receive all the latest motorsports articles, tech tips, race reports and news. In Part 2 we use video review to spot common driver mistakes with your footwork and discuss how to resolve them. Use your video review to spot common driver mistakes that you can fix. The seat doesn't move on a Spec Racer Ford. To accommodate different height drivers the pedal assembly moves fore and aft. After 4 years of racing here are some things I did well and others that I had wished I had done when I started wheel to wheel racing. Want to go faster? Here are 10 tips that helped me get faster lap times. Includes shared wisdom from other racers and things I have found work for me. Tire or tyre anyway you spell it they are one of the most important elements of the car. The following tips should help you keep them in great condition. Getting a great start can really help your results in a sprint race. Here are 5 essential tips for getting a great start.